Home / Is the VACUCAM® just an eductor? Because dry powder and liquid materials “pass through” our patented VACUCAM® Ejector Mixer, many mistake it for an eductor. The VACUCAM® is not an educator. Think of it this way. You can put a stick in the ground and determine the time using the sun, or you can check your watch. That’s the difference in efficiency and accuracy between an eductor and the VACUCAM® Ejector Mixer. Eductor: The standard eductor is perched under the powder hopper. Gravity feeds dry powder into the eductor while liquid is fed through the other side, simply combining the two types of materials. VACUCAM®: The VACUCAM technology achieves high-capacity and complete wetting by bringing together conditioned powder and highly atomized liquid from two separate streams. So it doesn’t just “combine”, it dynamically disperses particles of powder into particles of atomized liquid (dynamic dispersion). Watch how the VACUCAM® technology works. Eductor: The standard eductor brings the materials together for transport to the mix tank; complete mixing requires a separate step. VACUCAM®: The VACUCAM technology instantaneously combines the conditioned dry powder and liquid, delivering the final product into your tanks, eliminating the traditional shear mixing step. Eductor: The standard eductor produces limited vacuum and depends on gravity, which can leave a portion of your raw materials behind in the bulk bags or hoppers, making accuracy difficult to measure when scaling and weighing powders. VACUCAM®: The VACUCAM technology creates a near-perfect vacuum, resulting in no wasted material and an accuracy that can match any specification required. Eductor: The standard eductor’s incorporation rate is dependent on the speed of your mechanical hopper feed screw or how fast your team can load bulk bags. Additional mix time is required, after the dry solids have been incorporated. Eductor: Since the standard eductor is a mechanical process, it can be difficult to control the ratio of dry solid to liquid. VACUCAM®: The VACUCAM technology is part of a complete system solution so it can be customized using instrumentation, load cells, and flow and density meters to meet any speed requirements you require to maximize finished mix quality. Eductor: To scale up production requires the addition of more hoppers, eductors and shear mixing tanks. VACUCAM®: One VACUCAM system can do the work of multiple traditional eductor conveyance/shear mix systems. Eductor: The standard eductor simply combines materials for conveyance to a mixing tank. In the tank, mechanical shear is employed to mix the materials. However, traditional mixing often results in agglomeration, creating the need to spend time, money and energy on re-mixing processes to eliminate the “fish eyes” created. In addition, a substantial portion of your materials are lost in the re-processing, often in the bottom of your tanks or in your strainers. VACUCAM®: The VACUCAM technology achieves high capacity, instantaneous and complete wetting, dispensing particles of powder into particles of atomized liquid so agglomeration never occurs. With no “fish eyes” being created, you eliminate the remixing steps needed to remedy the consistency problem. Your final product is exactly the same for every production run. 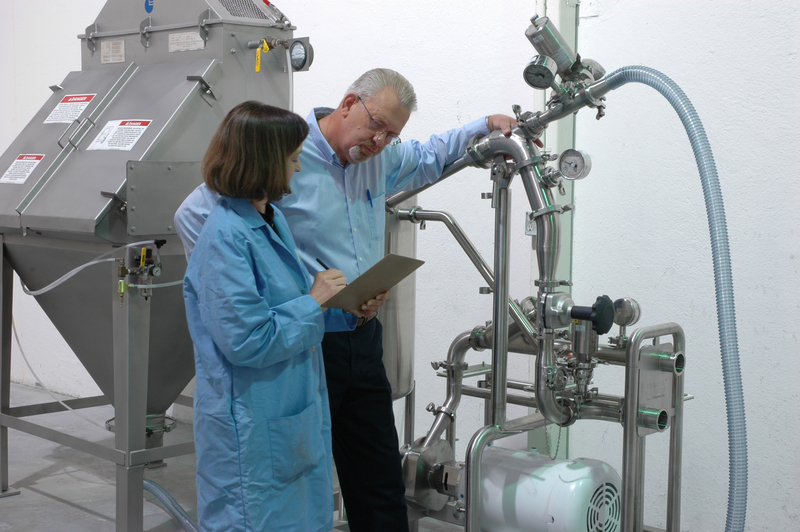 Still not sure how the Semi-Bulk Systems VACUCAM® processes can improve your production for beverage, confectionary, dairy, health and beauty products, paint and coatings and chemical manufacturing? Read more here or simply contact us with specifications and we’ll work through your custom scenario free of charge.